Excavation and concrete lining of the drainage. Pictures provided by: People’s Process on Housing and Poverty in Zambia. Engagement between the City Council, local NGOs and UN Environment Agencies can support the development of climate change adaptation, disaster risk reduction (DRR) and poverty alleviation strategies. Wide stakeholder engagement is necessary to ensure that the strategy plans can be accepted and implemented. Participatory approaches to climate change adaptation produce the best outputs when key decisions are made by those who are most affected. Local committees were formed for mobilisation, monitoring, operation and maintenance of drainage systems in Kanyama. The majority of the population of Lusaka live in peri-urban areas, which are of an unplanned nature, densely populated, and lack most of the basic infrastructure. Flooding is a regular climate risk. Damage to property, loss of lives and increase in water borne diseases and health risks have become inevitable and regular. Emergency responses to flooding through the disaster-management-and-mitigation unit lacked a viable long-term strategy and implementation plan. Poorly coordinated institutional responses often resulted in inefficient and sometimes duplicated efforts. In 2010, the Lusaka City Council received support from CARE International Zambia to improve the drainage systems in Kanyama, an area of the city that is most prone to flooding, and has the highest incidence of water-borne diseases (such as cholera). However, due to insufficient funds, the drainage blueprints designed were never installed. In the wake of this incomplete project, the United Nations Development Programme (UNDP), the Lusaka City Council and UN-Habitat developed a project with two aims: to create a city-wide strategy that would enhance responses to and management of disaster risk; and to carry out demonstration activities in a flood-prone area (Kanyama) in order to build long-term disaster-resilience capacity in Lusaka. This case study focuses on the demonstration activities. The strategy is designed as a long-term plan. To improve coordination, and to avoid duplication, the plan took into account previous work funded by CARE. Several factors contribute to Kanyama’s susceptibility to flooding (torrential rains and flash floods constitute significant hazards); including its impermeable surface geology, its general lack of drainage infrastructure, solid waste blockage in existing drains, as well as unplanned and unauthorised construction on drainage reserves. At the same time, Kanyama has to cope with the inadequate supply of potable water, which leads to a high incidence of water-borne diseases among residents. In addressing the goal of DRR, the project focuses on institutional coordination, capacity building, awareness raising, communication, and risk identification, as well as strengthening vulnerability and capacity assessment. In order to achieve this goal, a trans-disciplinary approach was used. Geographic Information System (GIS) methods were used to create a flood hazard and risk map of the area (UN-Habitat provided a GIS expert); community members were consulted using participatory processes; a land surveyor, a civil engineer, and planners provided technical support; and Kanyama’s residents assisted with the mapping, identification of the priorities, and provided labour for the actual construction of the drains. Construction of the flood drainage system commenced with full community participation, with community volunteers (including women) being engaged in the physical works. To ensure effective and seamless involvement of the community at all stages of the process, local committees were formed for mobilisation, monitoring, operation and maintenance. Throughout the implementation process, People Process on Housing and Poverty in Zambia (PPHPZ) was responsible for community organisation and mobilisation. 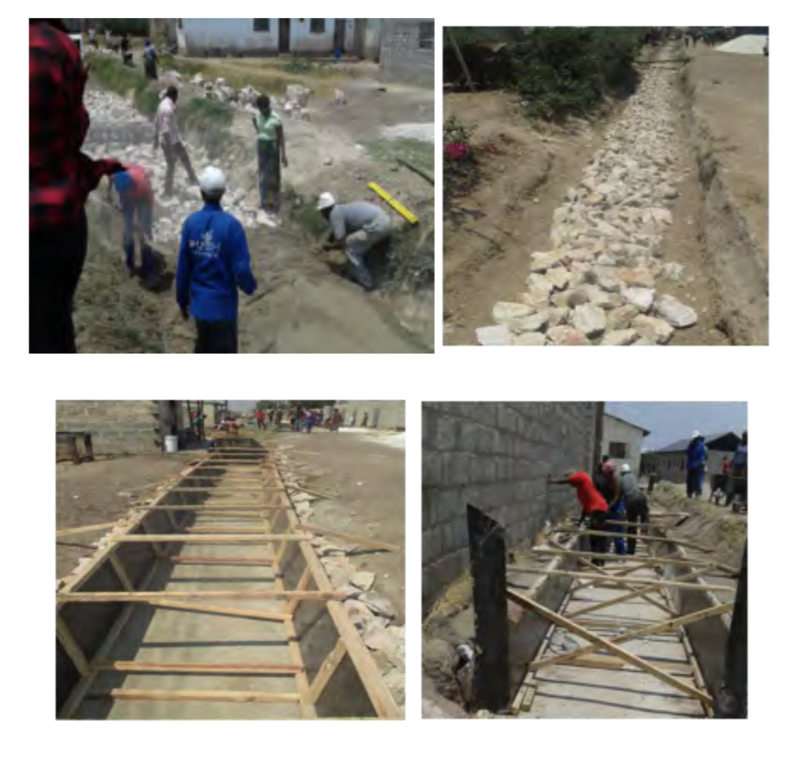 UN-Habitat provided financial assistance for the drain construction, and the Lusaka City Council provided technical support. Upgrading the drainage systems leads to an overall improvement of basic services such as water and sanitation (SDG 6) and thereby promotes healthy lives and enhanced well-being (SDG 3). By improving the drainage, Kanyama contributes to a system that is more resilient to the impacts of climate change (SDG 13). The described measures will furthermore contribute to a more resilient Kanyama (SDG 11) and to an alleviation of poverty of the people living there (SDG 1). Partnerships between the different institutions involved in the project also contribute to the sustainable development of the city at large (SDG 17). The community was expected to volunteer in the construction of the drainage, but some of the people involved believed that they should be paid. Though 200 people initially attended recruitment sessions, the number who registered dwindled to 95 after it was emphasised that the work would be strictly voluntary. The project experienced delays in the procurement and branding of the construction tools to be used. Blasting for the drainage lines damaged some nearby properties; a wall fence fell and windows were broken at a house. Kanyama has reduced its disaster risk from flooding through the installation of a three-kilometre long drainage system. Participatory processes have created a sense of ownership of the new drainage systems within the community, and it is hoped that this will reduce the risk of vandalism. The use of volunteers drastically reduced cost and the improved water flow reduces the risk of water-borne diseases in Kanyama. “Kanyama has greatly benefited from this project and we now feel safe from Cholera as the water has a passage to flow through, as we have been having a lot of floods without any drainage system,” says Nicodemus Kunda, a resident of Kanyama. Engagement between Lusaka City Council, PPHPZ and UN Environment Agencies can support the development of adaptation and DRR strategies. Wide stakeholder consultation is necessary to ensure that the strategy documents can be accepted and implemented. Participatory approaches to climate change adaptation produce the best outputs when key decisions are made by those who are most affected and who have a strong interest in contributing to an improvement of their local environment. However, this approach also means that participating groups, including those most vulnerable, responsible institutions and the city itself must be willing to negotiate strategies for adaptation. Continuing participation and engagement with local communities is facilitated by the formation of local committees. Conditions and remuneration/benefits for volunteers needs to be clear from the start of the process. The process needs a robust, inclusive plan to promote sustainable adaptation. Do you think this case succeeded in raising awareness of flood-prone areas in the city? What other strategies or actions could have been employed to raise awareness? What are the benefits to the community? Bringing community representatives into project scoping and planning at the very beginning seems really important so these representatives have a seat at the table in the planning and design of the project as opposed to being consulted once project plans are already underway and objectives are set. This should support greater community ownership of activities and projects. Does anyone have examples to share of projects where this has worked well? Here are some training modules on several of the methods that are part of the Mediation Adaptation Pathfinder and the European 7th Framework Programme project Mediation. This MEDIATION training module provides an introduction to Cost-Effectiveness Analysis (CEA), a widely used decision support tool that alternative options for achieving similar objectives.